Searching the roots of dowry system in the Indian subcontinent may take us to many myths intertwined with religions and cultural traditions. Ironically, speaking within the context of Kerala, the practice of dowry renders to incessant sleepless nights to many parents who worry about their daughters prospects when it comes giving their hands into marriage . The dowry tradition that is inherently ingrained into the very mind set of every Keralite – whether educated or not, rich or poor, has taken many lives to task that involves tragic incidents including divorces, torture, murder and suicides of brides . In an incident not long ago, Arul Selvi, a 30-year old Chennai RJ (Radio Jockey) for All India Radio’s Rainbow FM killed herself by hanging . Selvi, who was married just 2 months ago and was pregnant, was spending time at her parent’s house when the incident happened. Selvi’s family had reportedly paid gold and other gifts during and after her marriage, but squabbles over marriage and pongal gifts had reportedly created a rift between the two families. But what we may be conveniently ignorant about is a group of invisible group of people who are in the trade of gold – the indispensible yellow material that forms the core bargaining chip in the so called engagement talks held between both the families of the bride and groom. Turn on any one of the several dozens of Malayalam TV channels and you are bombarded with commercials on gold ornaments targeting young minds with their misleading and corrupted interpretations of an ideal wedding ceremony and the concept of aesthetics. 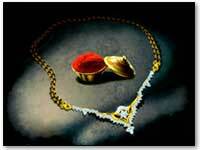 In recent years, jewellery advertisements have hijacked the symbolic concept of dowry which is nothing more than a tradition. The tactics used by the industry includes using attractive models and theme songs that subliminally instil unrealistic expectations about the bliss of wearing large quantities of ornaments during a wedding. The trend has polarized the society , demarcating between those who boast about imparting gold in kilos and those who struggle to meet the wedding expenses let alone a decent “mangal sutra” made of gold. Ironically, it is not surprising to learn that the a lion share of the ornaments thus given out as dowry soon disappears within two or three months into the marriage. It makes one wonder why an exercise of this kind has to be encouraged in our society. It is high time that a concerted effort to curb the practice of broadcasting the malicious adverts promoting the sale of gold jewellery is put in place. Pity, that we are all pretenders when it comes to practicing our ideology . Haseena sits on the smudged floor at a hospital bed that runs with the help of local Panchayat. She cannot lie down because the skins on both her back and lower abdomen are blistered with severe burns, cruelly inflicted by her husband. The reason ?. Haseena’s parents failed to meet their promise of endowing the remaining portion of dowry to her husband. But then Haseena is not alone in being victimized to such unscrupulous practice that is still prevalent in India, and particularly Kerala. Revathi, commerce graduate had a job at private company in Cochin when she go married to Raghavan, an automobile work shop owner . Customarily, she tied her knots with him in an arranged marriage in which parents from both the family sanctioned their union. Ironically , Raghavan still demanded a hefty dowry. Revathi’s father who is a mason did not have the means to raise the 2 lakhs he had demanded and the only option he had was to mortgage his small home in a 3 cents plot. Ravath’s father somehow raised Rs1,50000, but was unable to secure the remaining Rs 50000. And three months after the wedding, Raghavan was a changed man. He threatened Ravethi with a divorce petition unless the balance amount is settled . Soon he started physically abusing her, often inflicting severe wounds with kitchen knives. Ravathi suffered silently for almost two years before returning to her parents. Now she is raising her daughter all by herself. Luckly she still keeps her job. The incident may pose a prominent question. Why did Ravathi or her family yielded to such a culpable demand in the first place? Dowry has always been an perennial curse that keeps thrusting its sharp nails into the existence of most families in Kerala who raise daughters. An evil practice as it surely is , the time is way to past to put an end to this social anathema. But it has never been so easy. There has been isolated voices that raised in protest and so were a number campaigns to create awareness. Most outstandingly, there were few brave women who stood against those wicked men who considered marriage as way of gaining financial needs. It still comes as a relief , some socially conscious Keralites in the Gulf are coming forward to challenge the practice of dowry. Recently, an over seas Anti -dowry forum in Dubai based held to mark a commemoration get-together to honor founder president of the All India Anti-dowry movement late Mr. Mohammed Ali Padiyath who was a pioneer in running many campaigns against the dowry practice in Kerala . 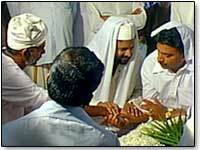 Padiyath was instrumental in facilitating a mass wedding in Kerala for many young couples hailing from poor families in Kerala. K.A. Jabbari is another senior member of “Vayanakootam” ( a voluntary Socio cultural literary forum) in Dubai & Kerala and the Mg. editor of Salafi times free journal who is tirelessly campaigning against dowry. The path to realizing a society that is free from materialistic demands is still way to far away. But the relentless work of those who believe in the goodness of humanity cannot go unheard and the benefit that comes along will be a boon to thousands upon thousands of women living in Kerala.